Want to become a better leader? 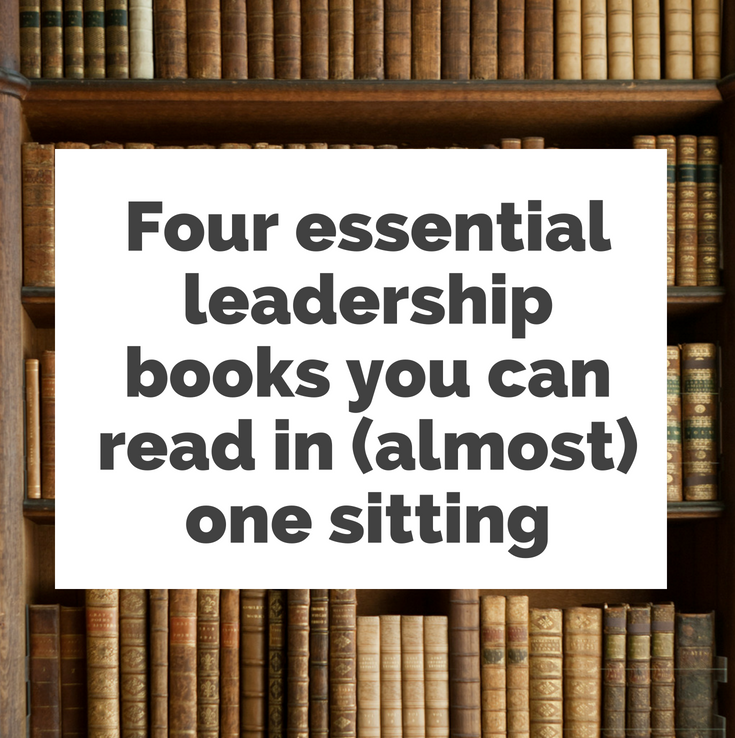 Here are four books you can read in a short time that will help you improve your leadership skills. 1. Eat That Frog! : 21 Great Ways to Stop Procrastinating and Get More Done in Less Time by Brian Tracy. Soft cover 144 pages. Brian Tracy lays out 21 bite-sized productivity techniques you can start using right away to accomplish the most important tasks you face. If you want to beat procrastination, accomplish more, and have more energy at the end of the day, you need this book. Click here to buy from Amazon. 2. The New One Minute Manager by Ken Blanchard and Spencer Johnson. Hardcover 112 pages. Excellent tips on how to use short interactions with people to clarify and motivate. Learn the skills of goal setting, praising, and redirecting behavior when necessary. You will be able to use these principles at work and also in your home. Updated in 2015 with tips for working with millennials. Click here to buy from Amazon. 3. Tribes: We Need You to Lead Us by Seth Godin. Hardcover 160 page. Godin argues there are groups of people (tribes) waiting for someone to step up and take a leadership role to help make change happen. Godin issues the challenge to step outside the status quo, become a leader, and find your own tribe which shares your views. Click here to buy from Amazon. 4. How to Fail at Almost Everything and Still Win Big: Kind of the Story of My Life by Scott Adams. Soft cover 256 pages. This book is Scott Adams’s observations on what works and what doesn’t in the game of life. Adams found ridiculous success as the Dilbert cartoonist by applying a few simple concepts that most people could use. The most powerful concept in the book is captured by Adams’s quote, “Goals are for losers; systems are for winners.” What he means is, chasing after goals can be unsatisfying since the time frame is somewhere in the future. (Example: "I want to lose 20 pounds by Christmas.") A system is when you decide to do several things on a regular basis that will increase your odds of future success. If you follow your system, your happiness will improve as you engage in your regular behaviors, and your odds of becoming successful will also improve. Grasping this concept alone is more than worth the price of the book. Click here to buy from Amazon.